"Your eyes can deceive you. Don't trust them." Wow! Star Wars fans - you don't want to miss out on this one. There has been an endless amount of art of all kinds made for Star Wars, whether it's fan art or pop art or even fine art, but there's still great work being made. Especially right now since everyone is so nostalgic, especially for the original trilogy. 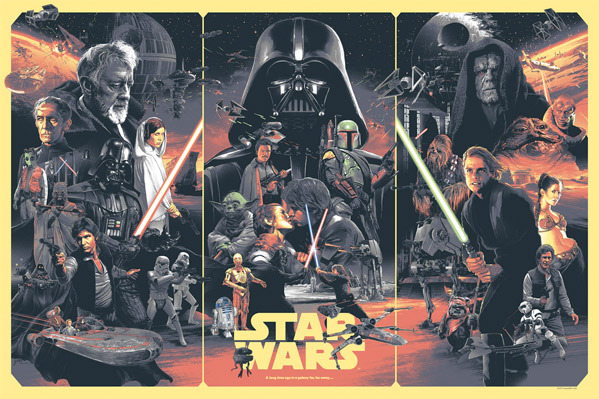 Bottleneck Gallery out of Brooklyn, NYC has licensed an official print by Gabz (aka Grzegorz Domaradzki) that is a triptych showing the entire original trilogy. It's something to behold, that's for sure. Great work. This 36" x 24" print is a timed release, meaning you can order from now through November 8th, and you are guaranteed to get one. Only $50! You know you want this on your wall. 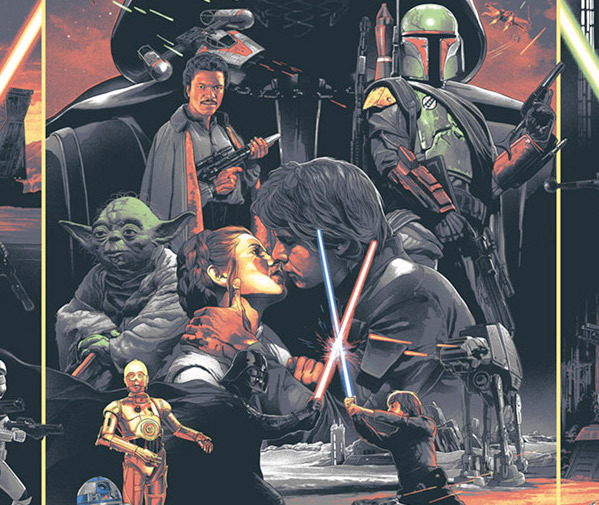 And here's a variant version of the Star Wars trilogy print by Gabz, also available sold out from Bottleneck. Gabz comments on the work via SlashFilm: "I have always been a huge Star Wars fan and I cannot even describe how profoundly thrilled and honored I was when I was given the opportunity to work on the original Star Wars trilogy. I had been actually planning to work on a personal Star Wars triptych for months, preparing rough notes and occasional sketches, so the timing could not have been better." These Star Wars prints just went on sale, starting November 5th, through Bottleneck Gallery and are officially licensed by Lucasfilm in partnership with Acme Archives. Each one is a 36" x 24" full color screen print. Either is worth hanging on your wall, preferably in a nice frame. For more info on Gabz, visit his website. Is that your favourite pick up line?